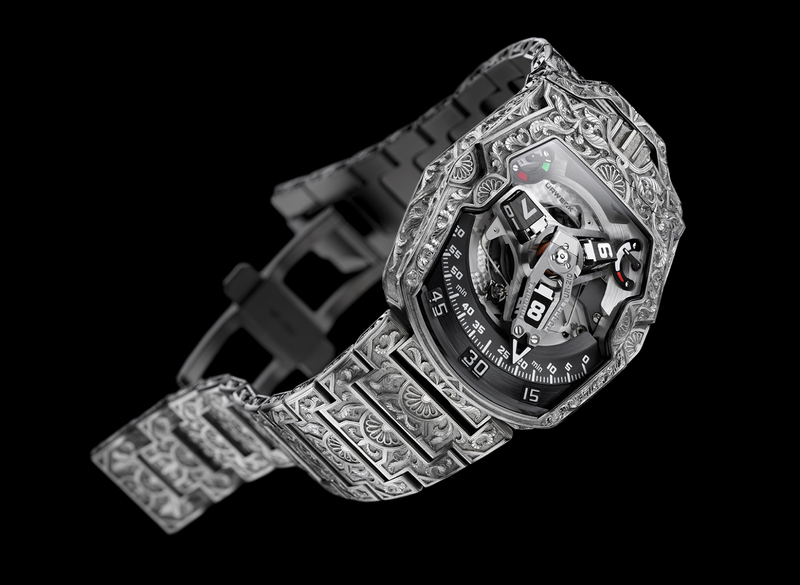 The UR-210 Dubai is a unique watch engraved by the expert hands of Florian Güllert. The artwork will be unveiled at the now established Dubai Watch Week hosted by Ahmed Seddiqi & sons, retailers. This one-of-a-kind UR-210 is themed on the spellbinding superlatives of Dubai, the maddening, yet tantalising megacity. For all its wealth and display, Dubai is also rich in sophisticated traditions. The cocktail of emotions stirred by the first experience of this breath-taking city is engraved forever in the metal of this timepiece. “I landed Dubai for the first time in 2007 after a seven hour flight from Geneva. The first shocking impression as you step out of the plane is the wave of heat than engulfs you — a hot dry breath that tells you immediately that you’re in a different latitude,” recalls watchmaker Felix Baumgartner, co-founder of Urwerk. “Then a welcome that you experience nowhere else. You dive into an extraordinary city of skyscrapers, highways and huge cars — extravagance as far as the eye can see. Dubai is a city that is in a perpetual process of transformation. Like New York in the eighties, it’s the city that never sleeps. After several hectic days, sudden calm and silence —my first encounter with the desert. Endless sand and a complete absence of sound in a world apart from the urban frenzy. I’ve tried to translate these strong and often contradictory sensations in the UR-210 Dubai — a watch dedicated to this exceptional city. It’s one of our most stunning creations, a state-of-the-art machine with the human touch of Florian Güllert’s hands. Carving arabesques and scrolls took almost 300 hours. “I immersed myself in art books on engraving and Middle Eastern decorative styles before embarking on this daunting project. But what joy!” declares Florian Güllert. “I’m used to the classic motifs you see on sporting guns, so I had to reappraise my working methods,” he admits. 1- A central shaft ensures the system’s stability. Pivoting on rubies, it is the rock on which the entire complication is constructed. A marine-chronometer spring along this axis provides the tension for the retrograde action. 2- The unconventional minutes hand, that acts like a kind of fairing around the satellite, frames the outsize hours numerals. It has been very precisely cut to tolerances of three microns. Forged out of aluminum, its total weight of 0.302 grams is perfectly poised by a brass counterbalance. 3- A double coaxial star cam governs the retrograde action. 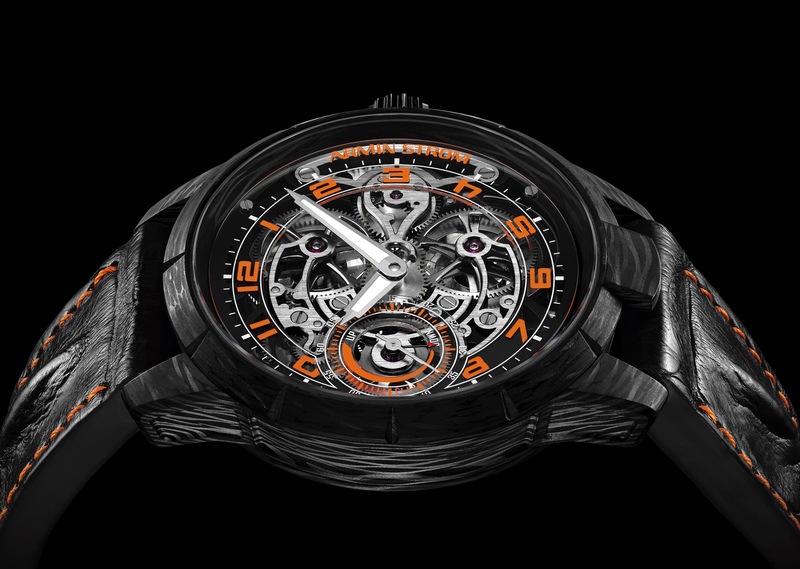 Its gearing and then its rotation will determine the trajectory of the minutes hand.